This entry was posted in AAOIFI, Bank Negara Malaysia, Islamic Banking, Malaysia, Mudharabah, Musyaraka, Qardh, Wadiah, Wakala Fi Istihmar and tagged IFSA 2013, Investment Account, Islamic Current Account, Mudharabah by Amir Alfatakh. Bookmark the permalink. Very informative article, if somehow you want your bank employees to be more knowledgeable in Islamic Banking, have them enrolled on courses such as.. Certified Islamic Banker there competence level in islamic banking will increase after they finish this course. Thanks Agapito. Ideally, readers should continue to enhance their knowledge as the more they learn about Islamic Banking, the more they realise the need to support the industry. Will smoothing practices (allocating reserves in PER and IRR) be discontinued after June 2015? Or will the bank maintain them despite these changes take place? 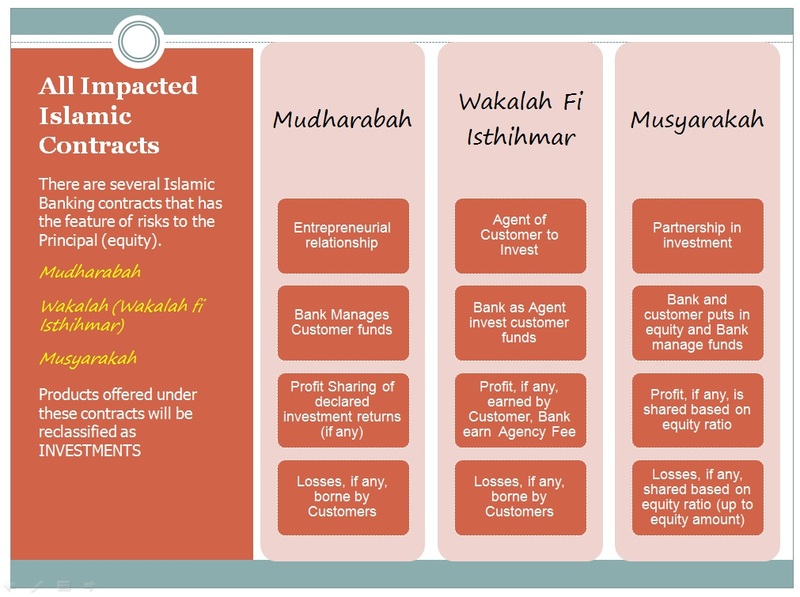 Displaced Commercial Risks are usually present in risk-sharing contracts such as Musyaraka (partnership), Wakala Fi Istihmar (agency for purpose of Investments) or Mudharabah (profit sharing entrepreneurship). There is always a “want” to pay a certain return to meet the expectancy of the fund provider or partner to ensure the funds or arrangement continues and not terminated or cancelled. This is where the need to manipulate the returns comes in; resulting in Displaced Commercial Risks. 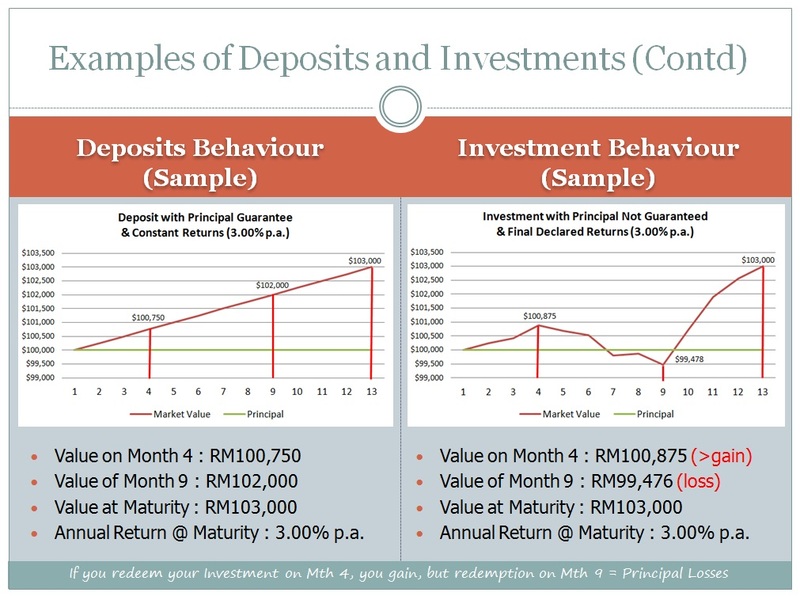 The three mentioned contracts are now defined by BNM as “Investment” categories and falls under the governance of the Investment Account Guidelines last issued in 2014. In the guidelines, it is specifically mentioned that the profit-smoothing techniques to address Displaced Commercial Risks are now NOT ALLOWED. Banks are to ensure they comply to this no later than 30 June 2015. First of thank you very much for all the informative posts you share. I have been reading your blog with great interest. In regard to the above post, could you please elaborate further on the background of why this kind of regulatory change was implemented? 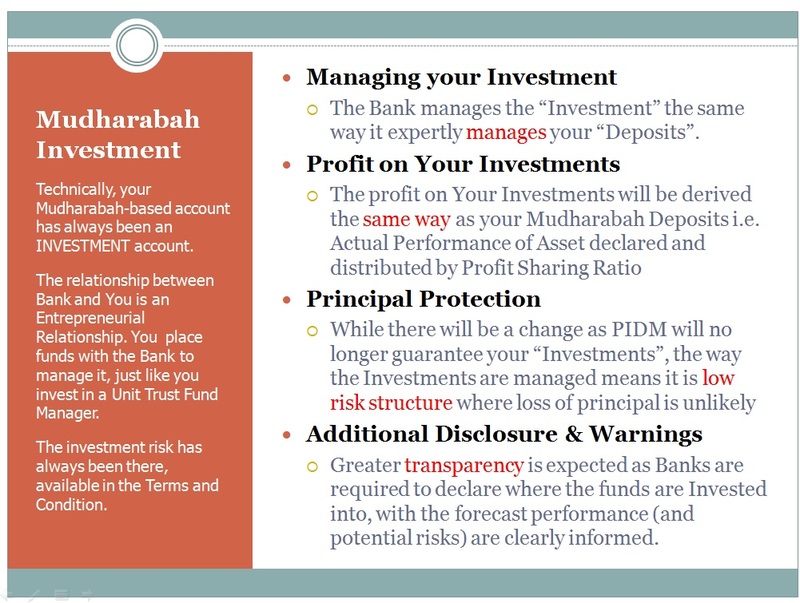 Was it BNM who simply wanted a clearer distinction between products (and to further develop Islamic investment accounts as separate products), did the PDMI also push for this as they did not see fit to guarantee principals of accounts that are not even guaranteed by the banks themselves, or does this have shariah compliance implications in it (that there should be no guarantee on investment accounts in any form)? I believe the main motivation of why Central Bank has re-looked at all th existing contracts, including the Mudharabah contract, is to capture the actual spirit of the contracts, as it should be. While encouraging innovation, Central Bank is also pushing for alignment to the basic tenets and intentions of the contract. 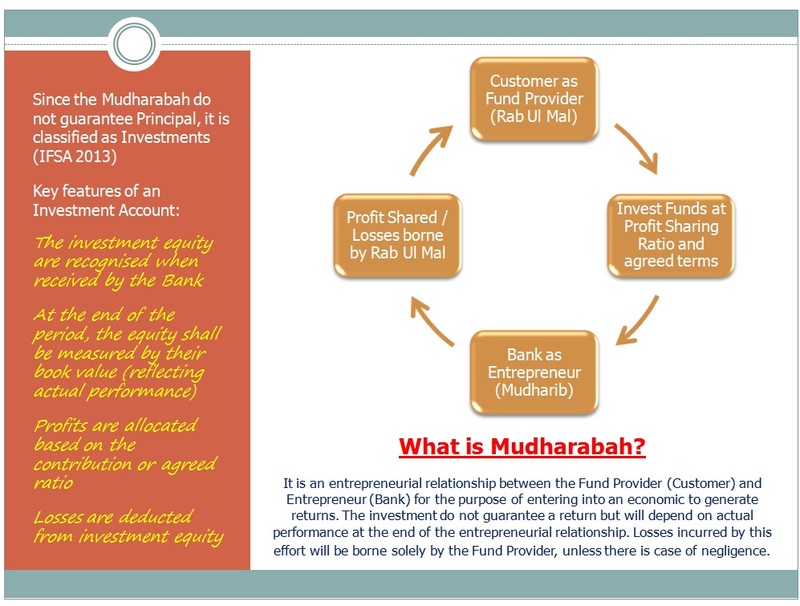 The Mudharabah, for example, is essentially an entrepreneurship contract and therefore closer to an investment arrangement instead of deposit. The guidelines aims to capture this holistically. Whether it could be operationalised effectively, will depend on each institutional capabilities. As for PIDM, definitely this is not a push by them. This move to Investment Account (where most big banks has started to move into) means loss of revenue for PIDM. 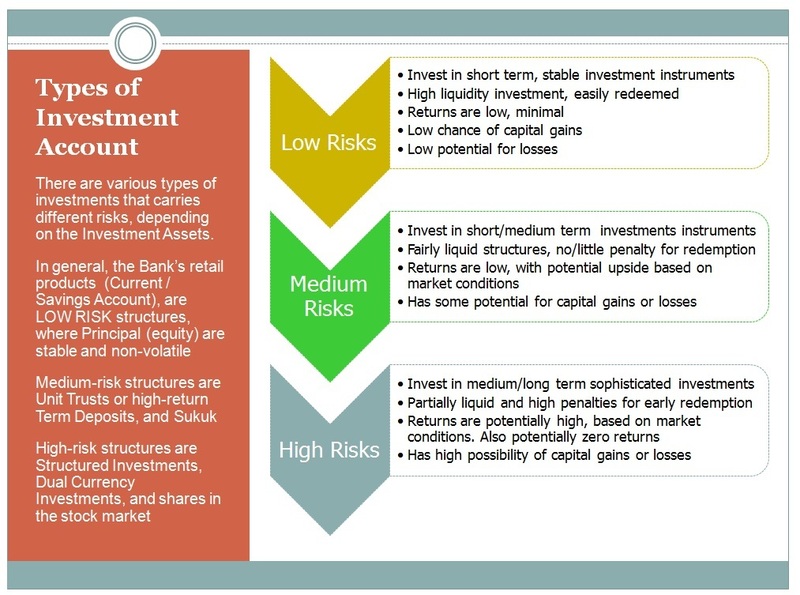 Their hands are tied as the regulation only allow them to “insure” only deposits; by moving to investments, PIDM can no longer cover these portfolios. There is no Shariah blockage to stop a Mudharabah structure to be guaranteed (for example by a third party), provided the structure can be introduced which meets all the shariah criteria. There are ways; up to each bank to find it. Thank you very much for sharing your insight. With all this in mind, would you argue that Islamic banks may lose part of their deposits (that would be classified as investments now) to funds or other asset managing firms, or will banks come up with attractive enough offers fast enough to prevent any outflow? I calculated based on the balance sheets of 6 (‘major’) Malaysian Islamic banks that the percentage (in terms of total customer deposits) of mudharabah and wakala deposits went down from approx. 70% in 2013, to 7% in 2015/6. I think a big portion of this decrease is due to automatic conversion into wadiah or commodity murabaha accounts which still are under the protection of the PIDM. Though, can we expect Islamic bank customers to slowly move part of their savings back into investment accounts at Islamic banks (rather than for example taking excess savings to securities firms)? Or are we looking at a new period where most clients will simply leave their money in wadia and commodity murabaha (maybe later qard as well) accounts and hope for hibah or. attractive commodity trading profits? It is without doubt that the huge drop of Mudharabah deposits resulted from the forced conversion into Wadiah. On average, it is estimated that the industry conversion is about 7% (and your estimates is correct!!!) and it will take time for these figures to increase. The hard fact is that most customers are seeking CASA equivalent products, not Investments. The customer profile has therefore become unsuitable for Investments. More importantly, at 30 June 2015, only 5-6 banks were able to come out with an Investment account which complies with BNM requirements. The rest is still moving and developing their structures, where their deposits are purely reliant on Wadiah. Now, it is interesting to see the impact of the conversion of the Wadiah into Qard by 2017. We would see then where the money flows to. The industry is expected to remain in a state of flux while all these standards are being issued. The other alternative is of course Commodity Murabahah but that also poses its own challenges. Thanks Amir for your insights. In relation to DCR, what are the alternative (in a point of view as a banker) to mitigate DCR since smoothing techniques are technically probihited by Invesment Account Policy endorsed by BNM? The idea by BNM that DCR should no longer be used as it tantamount to manipulation of returns and attempts to “guarantee” the principal. Banks have no choice but to provide “performance” returns. Technically, there is no such thing as Displaced Commercial Risk, as it is replaced by Market Risk, Interest Rate Risk and Valuation Risk. DCR happened when there is a mismatch between financial obligation, tenure and actual performance; but in Investment Account, the financial obligation is removed. DCR breaks down under IA. I know as banks who have been so used to the idea of DCR, this is hard to digest. But if you really take a step back and see Mudharaba as a structure, there really is no more DCR. But of course, Banks have trouble operating on the premise of uncertainty as it is reliant of actual performance for the payout. Banks still have some minor degree to mitigate DCR, but it is not like before. To control DCR, Banks may consider actively managing the composition of asset in the pool to give a stable return. Banks can also replace some of the assets thats not performing with performing ones for the next period of investment, and revise the Profit Sharing Ratio. This will result in some semblance of risk mitigation familiar by the conventional bank. But in my view, it is no longer necessary. Having DCR methodology for IA will ultimately defeat the intention of Mudharaba. 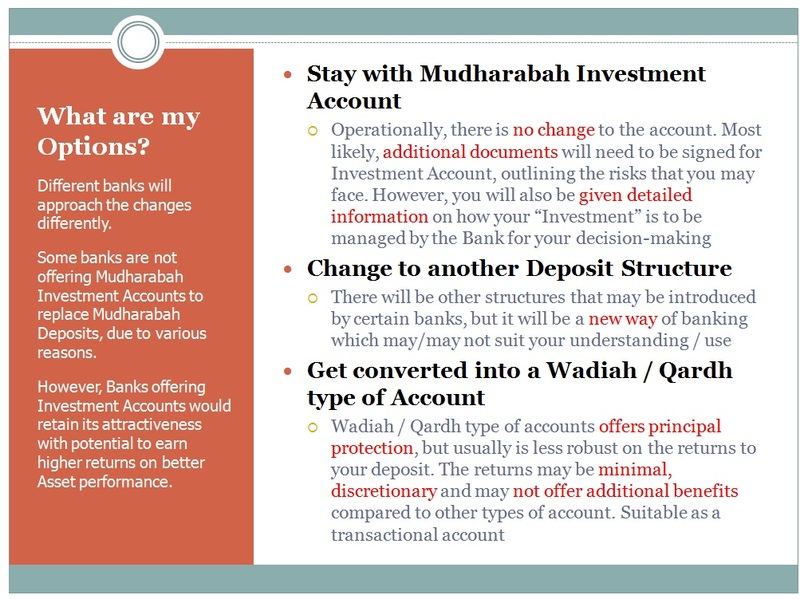 Is there any specific changes to legal contracts involved in mudharabah investment account? I am assuming that you are referring to the deposit leg of the mudharabah investment account, and not the financing leg of the structure. Legal contracts for Mudarabah investment (deposits) have always been in existence in the Terms and Condition of the product. 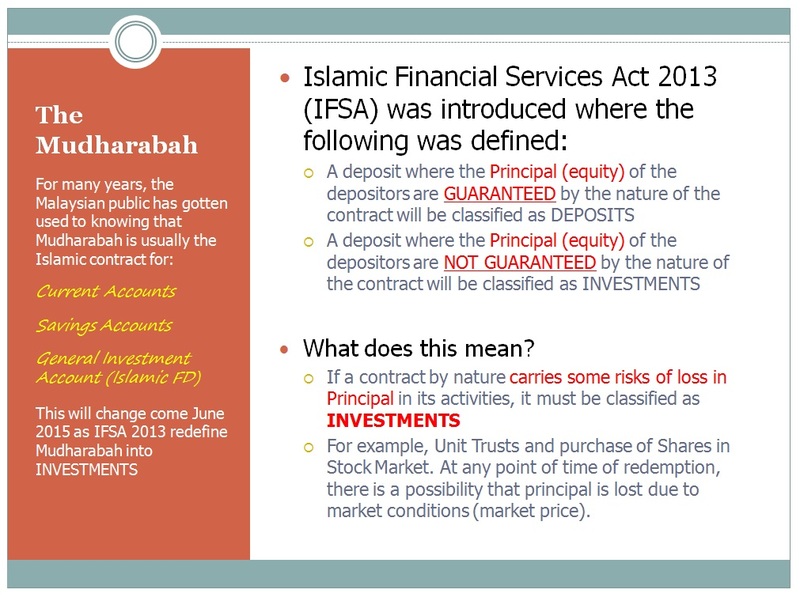 With IFSA 2013 on board, the language after IFSA 2013 remains very much similar to the earlier versions of Mudarabah Investments. If you notice, in the terms and conditions prior to 2013, the language also talks about valuation risks and equity risks, and remained consistent after 2013. What is different, however, is the statements of account to customers, the need to conduct Investment Account Holder risk assessment and determining the risk profile, reporting requirements and treatment of Restricted and Unrestricted Investment. Nonetheless, the legal contracts remains mainly intact whether it is drawn prior-IFSA 2013 or post-IFSA 2013.